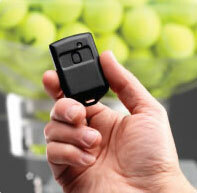 Remote will suspend the feeding of tennis balls from across the court, allowing for instruction between shots. The remote functions at a distance well over 120 feet. Our machine motors have noise-reducing capacitors and shielded cabling that insures a reliable, consistent signal from the remote transmitter. 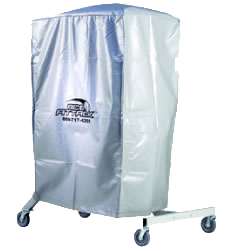 Lightweight weatherproof vinyl cover will protect the Ace Attack machine during outside or inside storage. Heavy duty brass bottom grommets will accommodate chain and lock for increased security.